Psalm 22:1-2 My God, my God, why have you forsaken me? Why are you so far from saving me, so far from my cries of anguish? 2 My God, I cry out by day, but you do not answer, by night, but I find no rest. Jesus entered Jerusalem on Sunday morning riding a donkey amid shouts of “Hosanna in the highest!” He is staggering out of Jerusalem on Friday morning, too weak to carry His own cross, amid shouts of “Crucify Him!” On Sunday, Jesus had been hailed as the “the Son of David” (Matthew 21:9), the Son of Israel’s greatest king. On Friday, Jesus is mocked as a Jewish king with a sign above His cross that reads, “The King of the Jews” (Matthew 27:37). Jesus is led out to Golgotha where He is crucified along with a criminal on either side of Him. A Roman centurion and his band of soldiers stand guard over Him, but they did not need to bother. Jesus’ friends are not mounting a rescue mission. They are cowering behind locked doors. Jesus’ supporters are silent because they are afraid of being accused of blasphemy or tried for treason. The crowds that were so energetic on Sunday morning are strangely silent on Friday afternoon. The Jewish leaders stand mocking and ridiculing Jesus, the crowds pass by the busy street shaking their heads on their way into Jerusalem. Even the two criminals at His side hurl insults. Jesus feels it all. He feels it emotionally. He feels it physically. Every movement scrapes the rough wood on His torn back. Every action causes the nerve endings in His hands and feet to scream with pain. Every breath is a struggle. Every attempt at speaking is an ordeal. He feels it spiritually. Jesus is rejected by humanity. He is cursed by God, because God has said, “Cursed is the man who hangs upon the tree” (Deuteronomy 21:23). He is abused by His countrymen and abandoned by His disciples. The sheep have scattered while the Shepherd endures the wolves’ attack. Jesus is alone. Even His heavenly Father has abandoned Him. Jesus is enduring great physical, emotional, and spiritual pain. The greatest pain that Jesus feels, though, is the pain brought upon Him by His heavenly Father. In the midst of His suffering on the cross, Jesus cries out in Aramaic, “Eloi, Eloi, lema sabachthani?” Matthew and Mark provide the translation: “My God, my God, why have you forsaken me?” (Matthew 27:46; Mark 15:34). During His hours upon the cross, Jesus prays through the Psalms. When He comes to Psalm 22, He voices David’s prayer out loud, “My God, my God, why have you forsaken me? Why are you so far from saving me, so far from my cries of anguish? My God, I cry out by day, but you do not answer, by night, but I find no rest” (Psalm 22:1-2). David wrote Psalm 22 a thousand years before Christ. Through the inspiration of the Holy Spirit, the Son of God is speaking through the mouth and pen of David. The Son expresses His feelings about enduring the unjust suffering at the hands of evil men and the just abandonment of God toward the sinner. These words of David are a direct prophecy to what is happening to Christ at the very moment He is praying these words. The scorning and mocking: “But I am a worm and not a man, scorned by everyone, despised by the people. All who see me mock me; they hurl insults, shaking their heads. ‘He trusts in the Lord,’ they say, ‘let the Lord rescue him. Let him deliver him, since he delights in him’” (Psalm 22:6-8). The physical agony of the crucifixion: “I am poured out like water, and all my bones are out of joint. My heart has turned to wax; it has melted within me. My mouth is dried up like a potsherd, and my tongue sticks to the roof of my mouth; you lay me in the dust of death” (Psalm 22:14-15). The enemies of Jesus gathered like vicious animals around the cross: “Many bulls surround me; strong bulls of Bashan encircle me. Roaring lions that tear their prey open their mouths wide against me. … Dogs surround me, a pack of villains encircles me; they pierce my hands and my feet. All my bones are on display; people stare and gloat over me. They divide my clothes among them and cast lots for my garment. (Psalm 22:12-13, 16-18). In the deepest depth and detail, Jesus fulfills this Psalm 22 prophecy. With everything Jesus endures during His crucifixion, the greatest anguish and fulfillment are in the opening words of Jesus’ prayer: “My God, my God, why have you forsaken me?” What does it mean to be “forsaken?” It means to be isolated, abandoned, deserted, and cast out. At the time that Jesus cries out, He has been on the cross for three hours. He cries out in a loud voice, expressing the depth of His agony. He could not feel His Father’s love during those three hours. Jesus is forsaken because, while He is on the cross, Jesus has all the sins of mankind heaped upon Him. He is feeling the venom of the serpent seep into His heel (Genesis 3:15). He is drinking every drop from the cup of God’s wrath (Matthew 26:39). For the only time in His life, Jesus cannot bear to call God His Father. Instead, He cries out in agony and abandonment, “My God, my God,” for He has been forsaken. The sins of humanity now separate the Son of God from the unity of the Trinity. Though we cannot begin to imagine how this can be, God the Son and God the Father are separated. God the Father is in heaven, while God the Son is suffering the eternal horrors of hell during these hours of separation. For hell is more than flames, fire, and sulfur. It is separation from God. Hell is the one place in the cosmos where God is not present. And that’s what Jesus is experiencing on the cross – the hell of being separated from His Father. You can hear the biting pain in Jesus’ heart-wrenching prayer, “My God, my God, why have you forsaken me?” God made Jesus, who had no sin, to be sin for us (2 Corinthians 5:21). The sinner must die, for the wages of sin is death (Romans 6:23). The righteous wrath of the Father would not allow sin to go without penalty. The scales of justice had to be balanced. The Father looked upon His Son hanging on the cross and saw nothing in Him but the world’s sin and guilt. The God who is a “consuming fire” against sin (Hebrews 12:29) unleashed the full fury of His wrath against His Son. Jesus was loaded with the sin of the world in order to atone for it (John 1:29). Why would God forsake His only begotten Son? It makes no sense. If ever there was anyone God should not forsake, it had to be Jesus. Jesus was always doing His Father’s business (Luke 2:49). He was constantly following His Father’s will (Matthew 12:50). Jesus never once strayed from the path of perfection. God wanted everyone to how exceptional His Son was, so on two separate occasions – at Jesus’ Baptism and His Transfiguration – the Father spoke from heaven saying, “This is my Son, whom I love. With him I am well pleased” (Matthew 3:17; Mark 9:7). But all of that pleasure changed when Jesus went to the cross. The Father no longer looked upon His Son with favor. Now, the Father looked upon His Son with disgust and horror. God is appalled by sin. God is holy. Sin cannot dwell in God’s holy presence. And, while Jesus was on the cross, all the sins of all people of all time were transferred to Jesus. He became the greatest sinner this world has ever known. God could not bear to look upon His Son. An unearthly darkness covered the land while Jesus was covered with humanity’s sin. God turns His back upon His Son. A shadow is cast over the divine becoming contaminated with sin. The Son cries out. The Father will not listen. He will not see. He will not act to save His Son. That sounds so cruel. So horrible. Why would God turn His back on His Son and abandon Him in the hour of His greatest need? God should forsake the murderers. Desert the criminals. Turn His back on the perverts and abusers. Abandon them, not the Son. This is what you must understand. You are the murderer, the criminal, the pervert, the abuser. If God did not turn His back on His Son, He would have to turn His back on us. Because of our sin, we should be cursed so that nothing ever goes right for us. We should suffer the physical and emotional consequences of our actions. We should endure the eternal punishment for our transgressions against God. We should be deserted from God’s grace and isolated from His mercy. All of this should happen to us because it was our sin that caused Jesus’ back to be torn open, the nails to pierce His perfect skin, the crown of thorns to be pounded into His skull. It was our sin that caused the sun to be blotted out that Friday afternoon. It was our sin that caused the Son to be forsaken by the Father. For with our sin, we killed the very Son of God. But that is the very reason that Jesus was forsaken by His Father – so we would not have to be. The wages of sin is death, but Jesus died in your place. He was numbered with the transgressors so that you could be counted with the saints. He was found guilty so that you might be found innocent. He was covered in the filth of your sin so that you might be covered with His righteousness. He was stripped of His clothes so that you might wear your white baptismal gown. He was despised and rejected by His countrymen so that you might be accepted into God’s holy family. He took your pain and endured your suffering so you might enjoy a paradise without tears. He was abandoned so that you might be adopted. He was pierced for your transgressions. He was crushed for your iniquities. His punishment brought you peace. And by His wounds you are healed. He was stricken, smitten, and afflicted, so that you could be redeemed, restored, and acquitted. The road to the empty tomb must first go past the bloody cross. You must see the horror of the Son of God hanging dead on Golgotha’s cross in order to see the glory of that Son of God rising from the dead at Easter dawn. After meditating long upon this fourth word of Jesus from the cross, Martin Luther exclaimed: “God was forsaken by God! Who can understand it?” Though we cannot begin to mine the depths of the horrors of hell Jesus felt by being forsaken by His Father, we are content in knowing that Jesus paid the price. Because of Jesus, now we don’t owe a single penny for our salvation. “My God, my God, why have you forsaken me?” Why did Jesus scream those words? So you’ll never have to. He was forsaken so you would be forgiven. Amen. 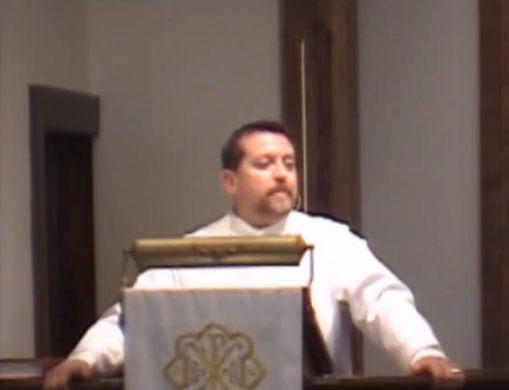 Watch past sermons online on our Facebook page.